Arriving at the Bar T 5 you begin your western adventure as you are shown the true meaning of western hospitality. 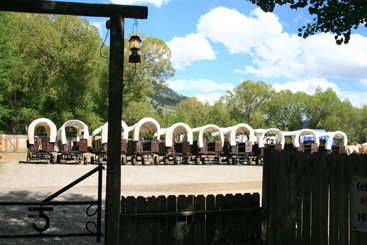 Traveling by horse drawn covered wagons you are swept away from the Town of Jackson into beautiful Cache Creek Canyon. Keep your eyes open, you never know who you may encounter on the trail, after all this is the west. With your own wrangler to guide, they will drive your team of horses up the trail. As you pull into camp you can smell the sweet aroma of a Dutch oven dinner, to welcome your arrival. The dinner bell ringing only means one thing, dinner is ready! Enjoy this savory home cooked meal as you not only go through the chow line once, but you can return all you want until we reach the bottom of the pots. Now that you have had your fill of dinner, the Bar T 5 Band takes the stage to entertain you with laughter and great hand clapping music. Complete your evening with a peaceful wagon ride out of the canyon, following the setting sun back into Jackson just as the old time cowboys did.